Myanmar is considered the final frontier in Southeast Asia. As the country has opened itself up to democracy and the world, it finds itself playing catch-up with the rest of the region which has experienced considerable economic and technological growth. To call its tech sector nascent would be an understatement. It’s only in the last two to three years that newfound companies have begun to see some investment, though limited, flow into the country’s tech startup scene. However, a budding market like this still presents opportunity. Justin Sway is a Myanmar-born investor. He was raised in Australia where he started his first businesses in areas like recruitment software. After a successful exit, selling his majority stake in a software firm named Fast Track, Sway returned to Myanmar to visit his place of birth and identified an opportunity. With the country opening up and internet and mobile access finally becoming a reality in the country, Sway decided to invest. Along with Jonah Levey, another experienced investor in Asia, he invested in two Myanmar tech startups, ShweProperty, for real estate listings and sales, and JobNet, a recruitment website. “We saw real estate and jobs, as far as classifieds, as the first to take off in terms of utilisation and monetisation,” he says. As the country loosens and allows foreign investment, unsurprisingly, tech startups on the ground are a long way from maturity and there is still much to learn. “It’s not a walk in the park. A lot of people think that they can just come here and make a lot of money and build a great business. It’s not that easy unless you have good capital; you need a lot of capital,” explains Sway. “People think you can just do it for a couple hundred thousand, you can’t. You need to know the culture, the economic climate, the landscape, and you need to know business. To get on the right track, there have been some concerted efforts locally. Phandeeyar is an innovation hub in the capital of Yangon that’s backed by the Omidyar Network, the philanthropic investment firm from eBay founder Pierre Omidyar. The organisation has invested $2 million in the hub, which has run accelerators to help entrepreneurs and start-ups make sense of their business and their future. 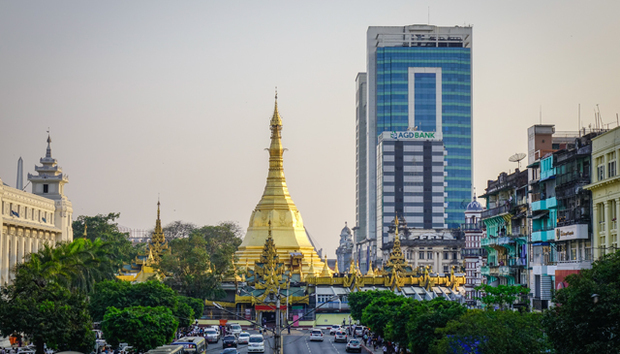 German startup factory Rocket Internet was one of the first internet firms to take a bet on Myanmar, launching a number of businesses in the country. Rocket operates the same approach in several Asian countries. It enters a market and sets up very familiar and proven businesses – like food delivery, classifieds, ride hailing – and pumps a lot of money into it. While it’s been a dubbed a copycat in the past, the firm has made big returns in the Southeast Asian market and was responsible for a lot of the early grunt work in Myanmar for finding viable business models. For investors, the pool of talented entrepreneurs with viable ideas is still limited and while latching on to a company at this early stage could prove fruitful, there will certainly be failures along the way too. “It’s a long way to go, I think the only way they can improve is … [we need] more people that are prepared to do the hard slog,” says Sway. To this end, companies like ShweProperty have sought outside help. It recently appointed a new managing director in Kevin Goos, who was previously CEO of Century 21, the largest real estate company in Cambodia. This nascent market, policy, and unpredictable flow of workers present an array of challenges and forces companies to adapt. What works in the west won’t work in Myanmar and investors need to be even wiser with their money in the country. The tech sector in Myanmar comes in waves too. After initial burst of activity a few years ago, things soon began quietening down but have since started to heat up again, says Sway, but with a population of over 50 million, the final frontier remains unconquered for now. « NetSuite ERP vs. Oracle ERP Cloud: Which should you use?